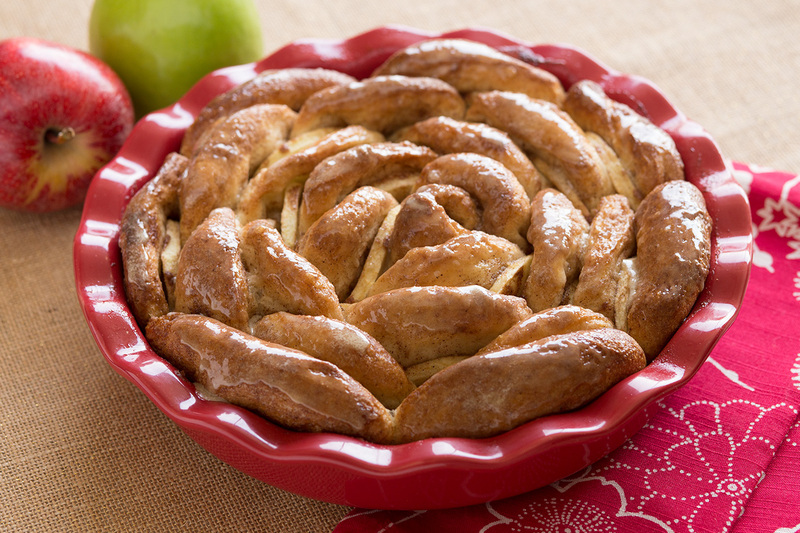 This fun recipe will remind you of an apple pie. Cut each roll in half. Combine sugar and cinnamon. Press and stretch each roll half into a 3 inch long piece of dough. Dip in melted butter and press into cinnamon sugar mixture. Start in the middle of a sprayed 9 inch round baking pan and place one roll piece wrapped around an apple piece. Then place a row of apple slices leaning against the dough. The next row, layer pressed and dipped dough, then apples until there are 4 rows each of apples and dough. Sprinkle any left over cinnamon sugar mixture over top of dough. Cover with sprayed plastic wrap and let rise until doubled. Remove wrap and bake at 350 degrees F 20-25 minutes. While baking make glaze. Melt butter in sauce pan and add brown sugar. Bring to a boil. Reduce heat and simmer and stir for two minutes. Stir in cider, return to a boil and remove from heat. Let cool slightly. Gradually stir in powdered sugar. If glaze is too thick, add a little more cider. Drizzle or brush glaze over warm, baked Apple Blossom.